My grandmother, Catherine Ann Kučinić Salopek, on 14 July 1929. After my grandmother passed away, I acquired a plastic bin full of old photos. Initially I glanced through the photos, and then I put them away in a very, very safe place never to disturb them again. It must have been ten years ago, or maybe it was longer….. Grandma died in 1987, so potentially the photos remained in the bin for over twenty years before I took them seriously. Perhaps you have a similar bin, box, or large manila envelope hiding in a “safe place”. 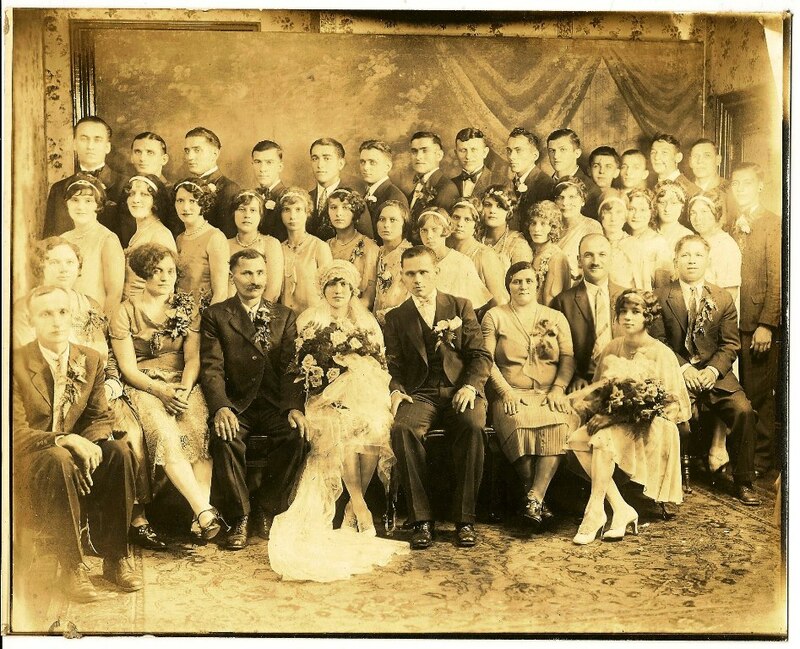 Two years ago I posted these wedding photos on a Facebook page to preserve them and share them with other Duquesne Croatians and their descendants. I decided to transfer them to a more permanent home on this site in hope that they might reach more people. Take a few minutes to search for familiar faces, and more especially share them with older generations of current and former Duquesne residents to see if they recognize anyone! 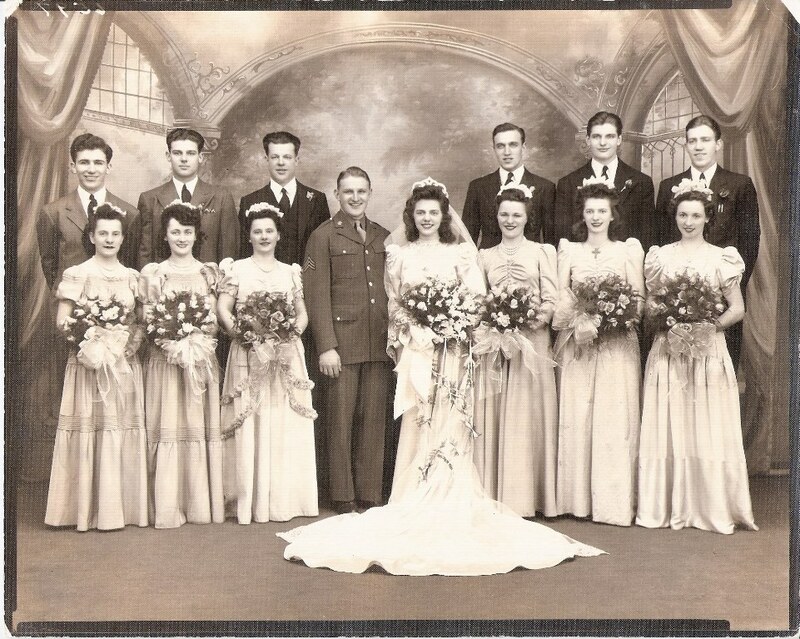 If you have information regarding these photos or want to contribute additional pre-1950 wedding photos, please comment below or contact me via the “contact” tab. I plan to update information and keep these photos posted as a CELEBRATION of our past! Many thanks to those people who already have helped identify faces of their relatives or who have contributed other information. Although this is not a photo of their actual wedding, it was among the treasures in my grandmother’s collection. Prior to the steel mill expansion, Ivan and Sylvia were the proprietors of the Milford Beer Garden located at “below the tracks” at 108 East Milford, Duquesne. Joseph S. Vučetić and Catherine R. Salopek (daughter of Miko Salopek and Mara Tomsavic) married in 1929. Bottom Row Left to Right: Kata Salopek, Tomo Salopek and their children; Rose Salopek Lokmer, Ivan/John Salopek (who died in a mill accident when he was 18 in 1941), and Mary Salopek Semago Esek. groom Joseph S. Vučetić and bride Catherine R. Salopek. 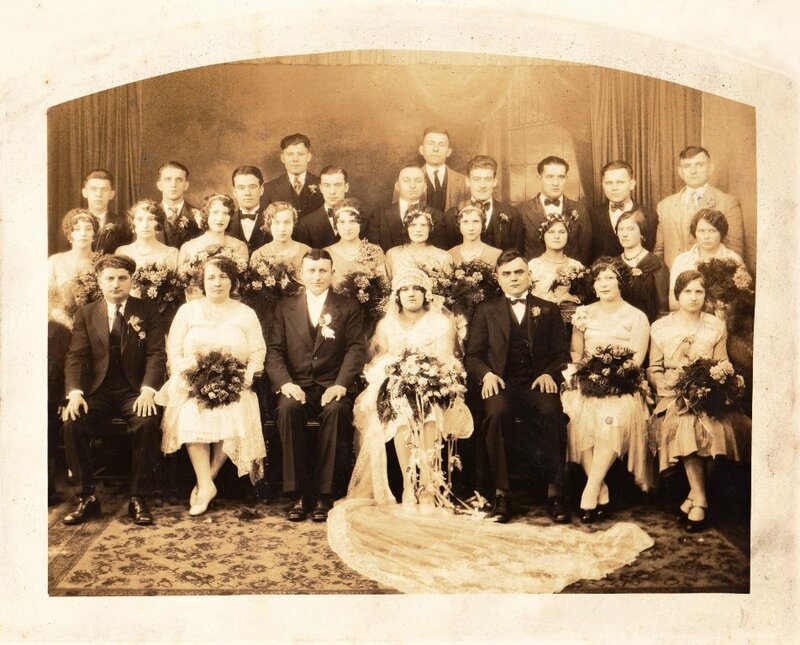 Anthony Joseph Salopek (son of Mate and Jaga Salopek) and Catherine Ann Kučinić (daughter of Mijat Kučinić and Ana Puškarić) married on 14 July 1929 at the Sacred Heart Church, McKeesport, Allegheny, Pennsylvania. Anthony was an early activist in the formation of the Duquesne Lodge 187 of Amalgamated Association of Iron, Steel, and Tin Workers. He became the first financial secretary of the Steelworker’s Organizing Committee, Duquesne Lodge 1256. 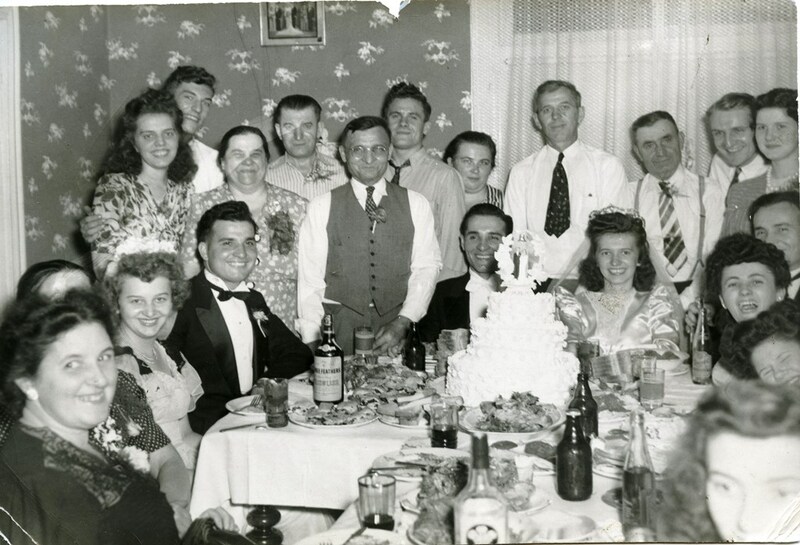 Bottom Row Left to Right: Male in foreground unknown, Jaga Puškarić Vučić, Sylvia Vojvoda, NEW: Franjo Salopek, bride Catherine Ann Kučinić and groom Anthony Joseph Salopek, Bara Salopek, unknown, Rose Vučić Tuchak (foreground), unknown. Middle Row Left to Right: 7th from left is Frances Salopek Bekavac, 10th from left is Mary Sucevic Lončarić ? 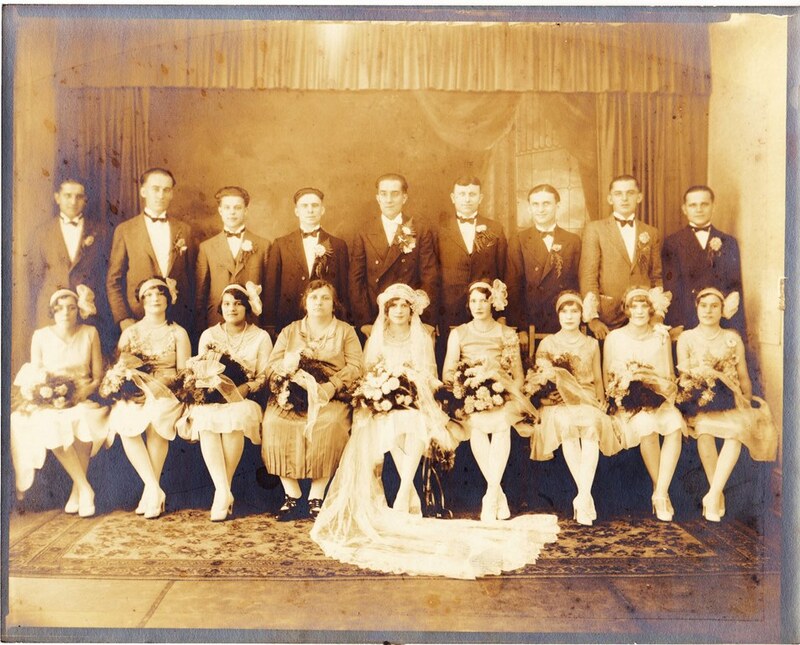 Pete Lončarić and Mary Sucevic (daughter of Franjo Šušević and Kata Blašković) married 26 January 1930 at the Sacred Heart Church, McKeesport, Allegheny, Pennsylvania. The Loncaric family owned and operated Green Gables for many years. Situated across the street from Kennywood Amusement Park, Green Gables was a social gathering place for Duquesne Croatians and countless others from surrounding communities. Pete Lončarić and Mary Sucevic married in 1930. George Baić (son of Janko Baić and Mara Bosiljevac) and Rose Salopek (daughter of Mate and Jaga Salopek) married on 12 April 1931 at Rankin, Allegheny, Pennsylvania . Rose passed away two years later on 20 December 1933 of acute appendicitis and was buried in the All Saint Braddock Catholic Cemetery in Braddock, Allegheny, Pennsylvania. George Baić (son of Janko Baić and Mara Bosiljevac) and Mary Migalić (daughter of Mijo and Jana Migalić) married after 20 December 1933. George Baić and Mary Migalić married sometime after 20 December 1933. 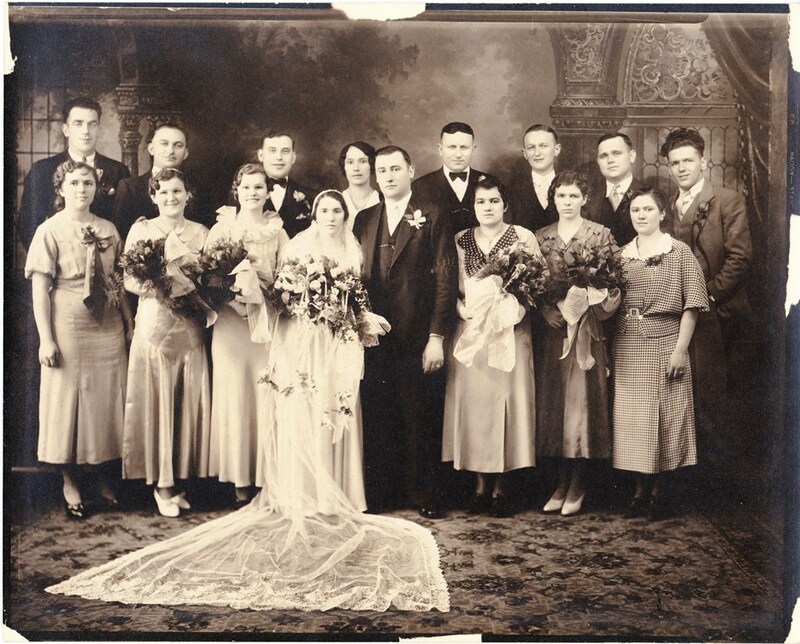 Bottom Row Left to Right: unknown, unknown, unknown, bride Mary Migalić and groom George Baić, Mary Sucevic Lončarić, unknown, Katie Kučinić Salopek. Back Row Left to Right: 2nd from left is possibly Andrew Kashlak ?, 5th from left Pete Lončarić, 7th from left Anthony J. Salopek, 8th from left possibly Joseph Vučetić ? 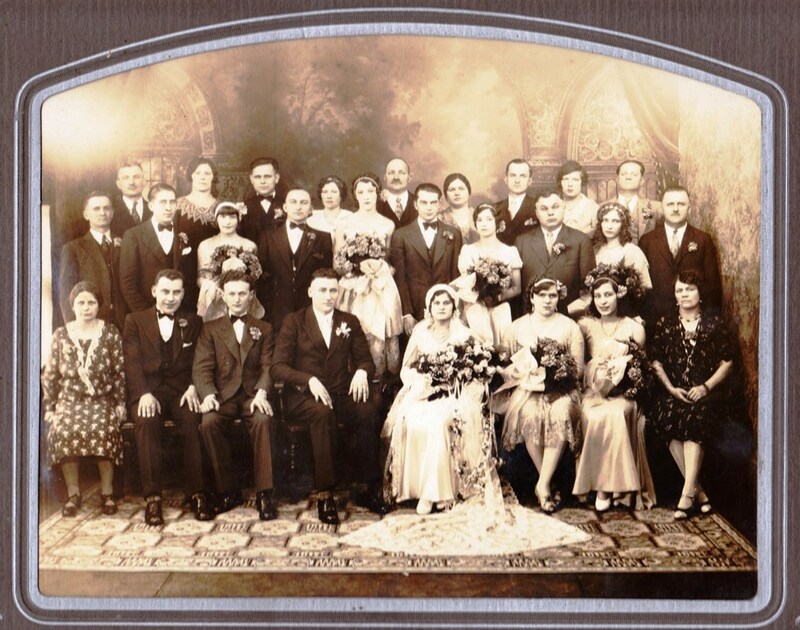 Nick M. Vučić (son of Mijo Vučić and Jaga Puškarić) and Caroline C. Tuchak (daughter of Mike and Magda Tuchak) married ……..
Back Row Left to Right: 2nd George Karačić, 5th Ivan Vojvoda, 6th Walter Salopek (son of Anthony and Marija Salopek), 8th unknown Salopek. Samuel Thomas Carr (son of Cornelius Carr and Elizabeth Austin) and Rose Ann Puskaric (daughter of Mark Puskaric and Manda “Susan” — could it be Sušanj?) married 31 October 1937 at Sacred Heart Church, McKeesport, Allegheny, Pennsylvania. Samuel T. Carr and Rose Puskaric married 31 October 1937 at McKeesport, Allegheny, Pennsylvania. Photo submitted by Eric Gerstbrein, grandson of Mato and Tonka Draskovich. Front Row Left to Right: Mary Bogden, Ann Knapp (Carr) later married the best man, Antoinette Magdic Draskovich matron of honor, Rose Puskaric bride, Barbara Stepetic (Churchman) bride’s step sister, Kay Bertovic (Stepetic) married bride’s step brother Michael, Frances Zelich. Back Row Left to Right: Unknown, unknown, Matthew (Mato) Draskovich, groom Samuel Thomas Carr groom, Cornelius (Neil) Carr best man and groom’s brother, unknown, unknown. Groom’s men still at large per Duquesne Times article. Please help identify: William Carr, John Knopka, Jack Stupar, John Bogden all of McKeesport. 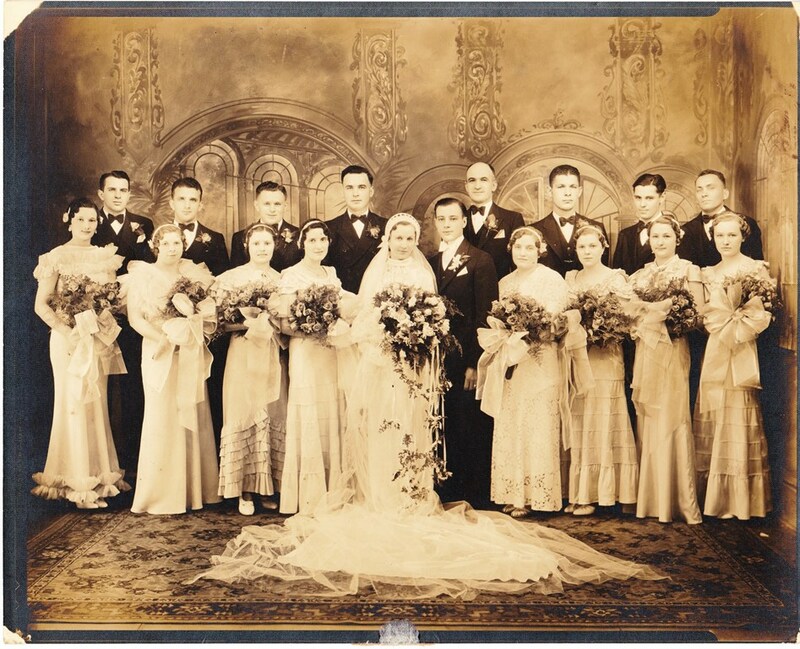 Thanks to Wendy Kingsland and her aunt for identifying many of the faces in the marriage photo! 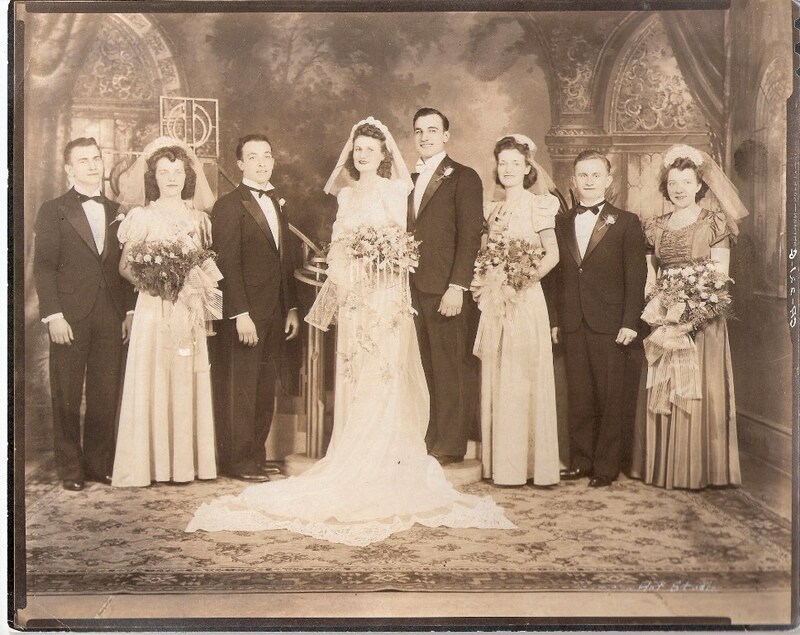 Andrew Szabo (son of Andrew and Florence Szabo) and Rose Salopek (daughter of Joso Salopek & Anna Salopek) married on 12 October 1940 at Sacred Heart Church, McKeesport, Allegheny, Pennsylvania. 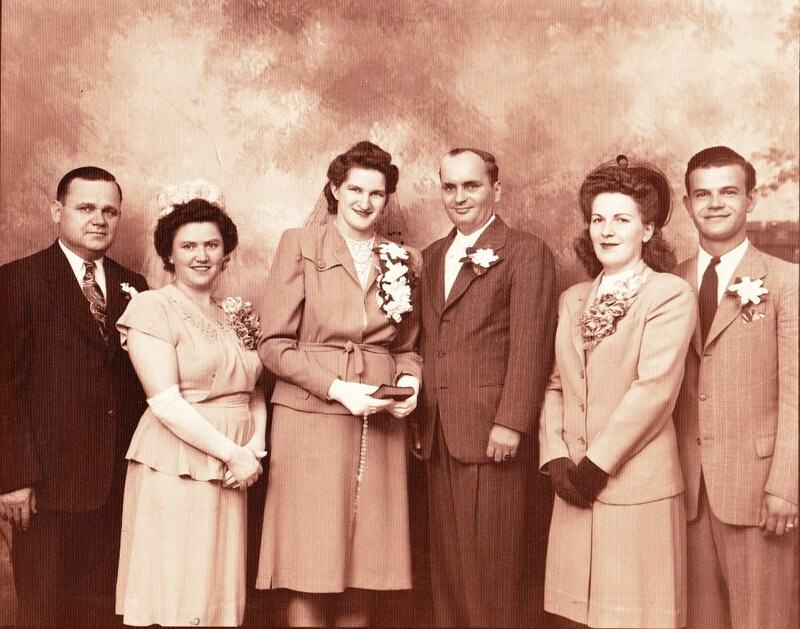 Frank J. Lokmer (son of Mike Lokmer and Catherine Prse) and Rose A. Salopek (daughter of Tomo Salopek and Kata Salopek) married on 7 February 1943 at Sacred Heart church, McKeesport, Allegheny, Pennsylvania. Frank should be a familiar face to many Duquesne Croatians. We will remember him as long time president of the American-Croatian Club of Duquesne. Frank J. Lokmer and Rose A. Salopek married on 7 February 1943 at the Sacred Heart church, McKeesport, Allegheny, Pennsylvania Photo and information courtesy of J. Semago. Updated information February 2018 courtesy of James R. Brletic, Sr.
Thomas G. Salopek (son of Franjo Salopek and Anna Salopek) and Cecelia P. Machek (daughter of Anthony Machek and Mary Olich) married on 25 July 1946 at St. Peter’s Church, McKeesport, Allegheny, Pennsylvania. Thomas G. Salopek and Cecelia P. Machek married on 25 July 1946 at St. Peter’s Church, McKeesport, Allegheny, Pennsylvania. 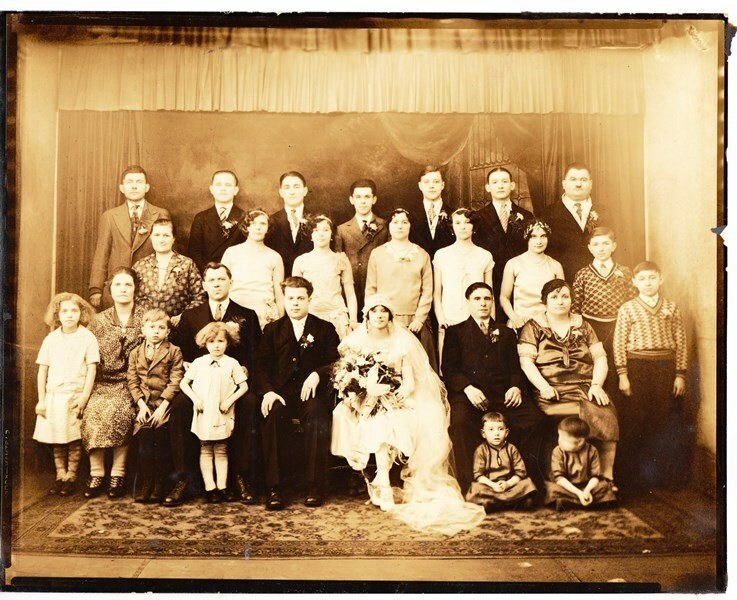 Seated Left to Right: Anna Salopek Bradich (daughter of Nick Salopek & Kata Turkovic, wife of Jacob Bradich), Unknown, Helen Borgan, George N Bradich (son of Jacob Bradich & Anna Salopek), groom Joseph S Semago (son of Michal Semega & Zuzanna Senko) and bride Mary Salopek (daughter of Tomo salopek & Kata Salopek), Jacob (Jack) Bradich (husband of Anna Salopek), Mary Salopek Kanski (daughter of Franjo Salopek & Bara Salopek), unknown Vucetic, Agnes Salopek Tomac (daughter of Franjo Salopek & Bara Salopek). 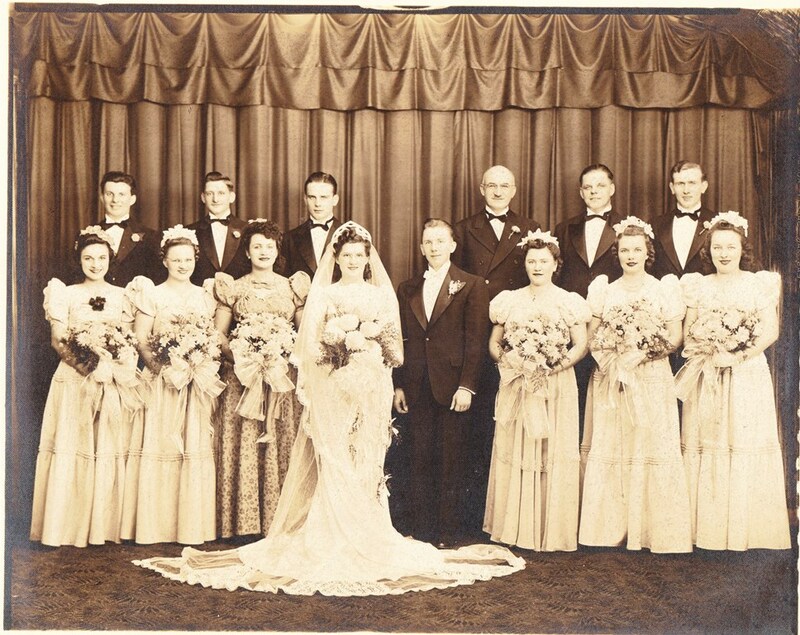 If you have information regarding these photos or want to contribute additional pre-1950 wedding photos, please comment below or contact me via the “contact” tab. ~ Thank you! Thank you, Mary Ann, for your contribution to the site. It is very exciting to identify another person among all these wonderful ancestors of ours! Thanks for viewing the site Janet! Feel free to contact me with any info you might have about your Salopek family, and I would be glad to help you dig a little deeper! My name is Kimberly Jo Salopek and my dad is Joseph J. Salopek, Mary Ann McMillen is my dad’s sister however, my parents divorced when I was a baby and I was not privi to my Croatian side sadly. these pictures fascinate me and I would love to know more about my Salopek family and see more pictures. Hi James! I have made the corrections under the photo. Please take a look at it and see if I identified individuals correctly. I would love to include your Grandma Betty’s maiden name. If you have that information, it would be wonderful for those searching for common relatives. Thank you!